Scott Samuel finished 1st in the 55-59 Year age group at The Best Damn Race in New Orleans on March 24th. He finished the half marathon in a time of 1:41:17, a pace of 7:42 per mile. He accepted his medal and posed atop the podium in first place. Scott was disqualified for cutting the course. There were no intermediate timing mats on the “Best Damn” Half Marathon course, but there is plenty of evidence to prove Scott cut the course. The runner was unable or unwilling to provide GPS data. When pressed by the race director, he would not share his information, claiming he was unfamiliar with the watch functions. Despite the R.D. sending detailed instructions on how to show the total distance and time of a prior run, Scott could not provide the data. Scott was photographed at approximately mile 4.5 at 8:18 am. Scott crossed the start at approximately 7:20 am. Scott’s pace through this point was roughly 12:53 minutes per mile. Below are the finish times and total overall pace of runners identified as being near Scott when he was photographed. The above chart shows that for Scott’s pace to believe, he would have run over 8-1/2 miles at just over 5 minutes per mile. The photographers were at the start of the out and back section leading up to mile five. It is apparent that Scott did not run all the way to the mile 9 turnaround point. Based on his pace, I estimate that, at most he ran 7.7 miles total. This would have taken him just past the 6 mile water stop before turning around. In my communications with the Race Director, he explained that the lack of a timing mat was an oversight. They generally have a timing mat at the 5k point on the half marathon course. Next year, he says they will have two intermediate timing mats. One week before The Best Damn Race in New Orleans, Scott ran The Shamrock Run 8k in a time of 56:08, a pace of 11:18 per mile. This is more than 3-1/2 minutes per mile slower than his alleged half marathon time one week later. 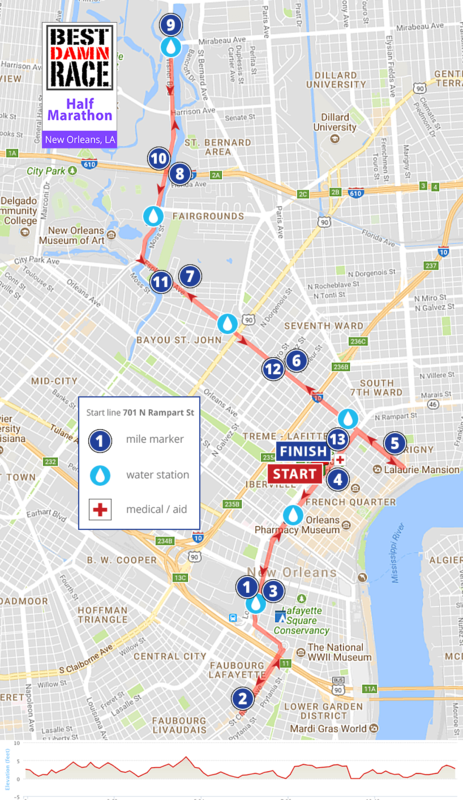 Scott was wearing a Marathon bib for the 2018 Louisiana Marathon, but he was dropped to the half marathon results. He ran a time of 3:20:59. This is One Hour and 40 Minutes slower than his “Best Damn” result. Scott finished third in his age group at The Bring it To The Bay Triathlon. There are two things about this race that immediately jump out. His swim time of 12:19.5 was the second fastest time in the entire field of 235 competitors. He ran the 5k in a time of 25:38.6, at a pace of 8:16 per mile. This pace is much faster than any of his other non contested results. His run time ranked 26th among all competitors. I reached out to Scott. Hi Scott, I am the owner of MarathonInvestigation.com. I wanted to give you a heads up that I am planning an article mainly focused on Best Damn Race New Orleans. In researching, I came across your result at Bring it To The Bay. In that race you had the (2nd) fastest swim time of the entire field, and your run time seemed fast when compared to your historical results. Let me know if you’d like to comment on either race. Thank You. Previous articleBib Stealing and Course Cutting at The Barkley Marathons? Good catch! Again with the double letters. Am I doomed? My last name has a double letter! What can I do to not be infected by this? What are the rules? Do the letters have to be adjacent? What if the first name ends and the second name begins with the same letter? I have double letters in my first and last name. Is that like a double negative, cancelling out if I try to cheat?! Your blog and podcast continue to serve as a case study in strange human behavior. I can’t quite identify the common thread in these cheaters, but something is off. It is telling when someone gets called out and immediately shifts to accusing you. I would say that “get a life” is fine advice for someone who regularly cheats to win AG podiums. I am catching up on the podcast, and appreciate the co-host’s counterbalance, but I hope that as time goes on I will see his mellowing of his position. Fairness and truth actually matter, and this is a place where those things are measurable and ought to be uncontroversial. So far from what I have seen of your work, you have a high bar of burden of proof before publishing. Keep maintaining that and I trust that MI will grow as a reliable source of integrity. The triathlon results are quite intriguing. After posting a phenomenal 12:20 800M swim (~1:30 per 100M), faster than competitors about half his age, Scott took a leisurely 3.5 minutes to make the swim-bike transition while most swimmers finishing shortly after him took less than a minute. Doesn’t know how to use a watch but wears it anyway? I wonder if he’s got an account with Strava or Garmin Connect which would disprove this claim. Maybe he won it in a raffle, and just uses it to tell time? He’s wearing a 920XT and looks like he’s pushing the “stop” button. It’s not a complicated watch to operate. As a triathlete, I’m particularly interested in his triathlon result. Any idea how he would have gotten that swim time? I’m skeptical of him being 2/235 on the swim, but that would be the most difficult leg to cut, so I’m wondering what happened there. The “I don’t know how to use my watch” excuse is pretty lame. Probably 2 loops of a 400m swim (no beach exit to start 2nd lap) or a long straight out 400m, back 400m where he could have went part way, treaded/drifted onto the other side, and started to come back to shore. Easy. He jumped in, treaded water for a bit, got out. It was a simple out and back w one buoy. Maybe it was a double loop swim and he only did one loop. That’s the only way I can think of; the support people in the kayaks etc would definitely notice someone swimming way out of the way of everyone else. The swim was a one buoy out and back with a beach start. I know plenty of slow runners who are surprisingly fast swimmers. out and back swim–probably just cut it short of the buoy. Easy to do in a crowd if one is motivated to so such things. Happened in a local race I did last summer on a similar sort of swim. Even that takes some gumption since they usually have kayaks patrolling. Yeah, although if it’s a crowded enough swim I suspect one can get away with it; usually I presume the kayakers are looking for distressed swimmers rather than cheaters. In the race I was in where someone did this, the scofflaw was spotted by a kayaker but there were no numbers on the swim caps–which seems to be the norm rather than the exception–so they couldn’t track him down. Having been a safety kayaker, I have never worried about cheaters – they really are not my concern. I’ve done a few triathlons where the swim is 2 or 3 laps. He could have just done a single lap. Check out his times for the 2019 Amazing Half. Started slow, 11:57 pace at 3.1, missed two subsequent mats, but finished the Half at 1:53, or 8:28 overall pace. He would have to run 7:36 pace for 10 miles to pull that off. “I dropped $300+ on a Garmin triathlon watch, but I don’t know how to use it” said no one ever. He couldn’t hold a 5:05 pace for a 5k, forget about 8 miles. Absolutely busted. No one who has run a valid, AG winning race would respond to anyone questioning their result in that way unless they had something to hide. I’d bet everything I own he couldn’t hold a 5:05 pace for 1 mile. Few people can. I won my AG at BDR Safety Hardor a few years ago and this makes me very sas. That red RWB shirt gives me JD Greening flashbacks. DM me about negative splitz! Saw his results in the Louisiana Triathlon and he was 249/250 in the swim portion…likely proves that there is no way he would ever finish 2nd the swim.